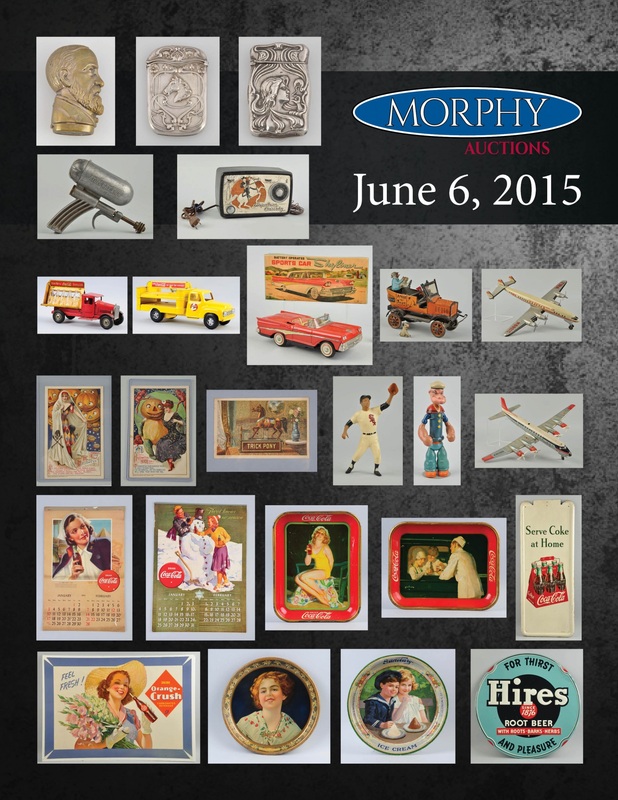 Over 750 lots will be presented at auction on June 6th. The auction begins with advertising, beer trays, and Coca-Cola items. Following those will be paper and cardboard advertising along with signs, serving trays, thermometer, bottles, and toys. Soda advertising is strong in this sale with Hires, Whistle, Pepsi, and others represented. Presented next is a nice selection of straw holders followed by more advertising. Over 100 sterling and figural match safes are next. A few cast iron doorstops and banks are followed by tin toys and character toys as well as transportation toys. A small selection of dolls, including Corgi & G.I. Joe dolls, paper weights, and marbles. A nice selection of Ray toy guns and trains, followed by sports memorabilia – including: cards, Hartland Figural and Bobbin Heads. There are early coins and jewelry with large lots of vintage jewelry both sterling and costume. Postcards are in abundance with most fields represented with Tucks, Borleau, Brundauge, Clapsaddle and others. General antiques are spread throughout the sale with many interesting pieces.